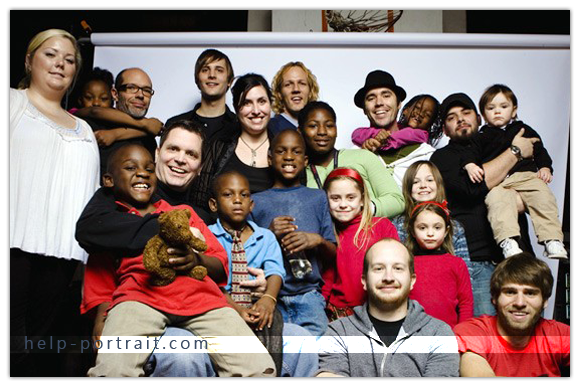 This year, be part of Help-Portrait 2010 ! Founded by Celebrity Photographer Jeremy Cowart, Help-Portrait is a community of photographers, coming together across the world to use their photography skills to give back to their local community.On or around 04 December, photographers around the world will be grabbing their cameras, finding people in need and taking their picture. When the prints are ready, the photographs get delivered.Yep. It really is that easy.And by the way, we don’t want to see your photos. This is about GIVING the pictures, not taking them. These portraits are not for your portfolio, website, or for sale. Money isn’t involved here. This holiday season, you have the chance to give a family something they may have never had before—a portrait together. Our mission at Help-Portrait is simply to equip and mobilize you, the photography community. We want to make sure you have all the information that you need to successful participate in Help-Portrait on 04 December 2010. We want to help you find other people in your area that are wanting to be part of Help-Portrait or have already begun to plan the event. We want you to have the opportunity to give.The best place to connect with other photographers, download important documents, and read up on some useful Help-Portrait planning tips is our COMMUNITY SITE.